Born: Mary Adrienne Steckling in St. Joseph, Missouri, 7 November 1934. Education: Attended St. Joseph Junior College, 1953; studied retailing and design, Washington University (School of Fine Arts), St.
Adri, 1967: jersey minipants suit and shoes decorated with nail heads. Louis, 1954-55, and fashion design at Parsons School of Design, New York, 1955-56; studied at the New School for Social Research, New York, 1956-57. Family: Married Fabio Coen, 1982. Career: Guest editor, Mademoiselle, college issue, 1955; design assistant for Oleg Cassini, Inc., New York, 1957-58; design assistant, later designer, B.H. Wragge, New York, 1960-67; opened Adri Designs Inc., 1966-67; formed Design Establishment, Inc. with Leonard Sunshine and the Anne Fogarty Co., New York, for the Clothes Circuit by Adri and Collector's Items by Adri division of Anne Fogarty, 1968-72; partner with William Parnes in Adri label for Paul Parnes's Adri Sporthoughts Ltd., 1972-74; designed for Ben Shaw company, 1975-76; Adri for Royal Robes, leisurewear, under license, 1976-77; Jerry Silverman Sport by Adri label, 1977-78; ADRI label collection for Jones New York, 1978-79; ADRI collection marketed by Habitat Industries, 1980-83; began as critic, Parsons School of Design, 1982; Japanese licensee N. Nomura & Co. Ltd, 1982-87; ADRI Collection marketed by Adri Clotheslab, 1983-87. Created Adri designer patterns for Vogue, 1982; designed several sportswear collections a year, selling to smaller specialty stores and private customers; joined Parsons School of Design faculty, 1991; corporate name changed to Adri Studio Ltd., 1994. Exhibitions: Innovative Contemporary Fashion: Adri and McCardell, Smithsonian Institution, Washington, D.C., 1971; various shows, Fashion Institute of Technology, New York City. Awards: Coty American Fashion Critics "Winnie" award, 1982; "International Best Five," Asahi Shimbun, Tokyo, 1986. Member: Council of Fashion Designers of America. Address: 143 West 20th Street, New York, NY, 10011, USA. "The Find: Adri," in Women's Wear Daily (New York), 7 November 1966. "Adri Opens the Door," in Women's Wear Daily (New York), 30 October 1968. Banik, Sheila, "The Adventures of Adri: A Designer Goes From Wragge to Riches," in Savvy (New York), October 1980. Burggraf, Helen, "Adri: Soft and Easy Designs for the Fast-Paced 1980s," in New York Apparel News, Spring 1982. Morris, Bernadine, "Banks and Adri Win Coty Awards and Cheers," in the New York Times, 25 September 1982. ——, "From Ellis, a Casual Whimsicality, " in the New York Times, 27 October 1982. ——, "A Sportswear Preview: Fall on Seventh Avenue," in the New York Times, 5 April 1983. I believe in a "design continuum" of clothing that is essentially modern, that reflects the changing patterns of living, evolving gradually but continually. Good design can be directional and timeless, functional and innovative in the tradition of American sportswear, and responsive to the needs of a woman equally committed to professional responsibilities and an enduring personal style. From the moment she fell in love with her first Claire McCardell dress while still a teenager—a dress she copied for herself many times because it fit her so well—Adri (Adrienne Steckling-Coen) idolized McCardell who, coincidentally, was one of her lecturers at the Parsons School of Design in New York. Adri's early years with B.H. Wragge taught her the principles of tailoring and mix-and-match separates, long a staple of American sportswear. Designing for Anne Fogarty reinforced the feminine focus of Adri's design philosophy. Always, she returned to McCardell's tenet of form following function. Shapes were simple, skimming the body without extraneous detail or fussiness, often based on the practicality of athletic wear. While McCardell favored dresses, Adri emphasized trousers, later designing skirt-length trousers, or culottes, for variety. From the beginning Adri utilized soft, pliable fabrics such as knits, jerseys, crêpe de Chine, challis, and leather. Her clothes were identified by their floaty qualities and she maintained that this softness made them easy to wear and provided relief from the frequent harshness of modern life. They were also ideal for tall, long-limbed, slender figures like her own. 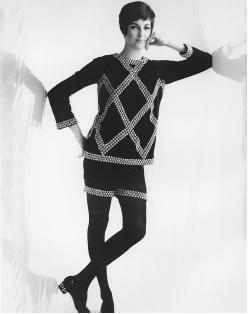 During the late 1960s Adri presented V-necked short dresses with high waists or wrapped fronts, in solid colored synthetic jerseys. Natural fibers, such as unbleached linen, came of use in the 1970s and knits continued to be staples for Adri skirts, trousers, and tunics in various lengths. By 1980 a typical Adri evening look consisted of silk trousers topped by a strapless chenille top and fluid lace jacket. Interchangeable neutral solids such as beige, black, and white were combined with bold primary colors so Adri's customers could collect the separates throughout the years and create their own ensembles, without having to purchase a new wardrobe each year. The simple timelessness of the designs, as well as their easy cut and fit, made this possible. Prices were in the moderate to better sportswear range. Adri wore her own apparel to accept her Coty award in 1982: a belted silver-grey (she called it "platinum") mohair sweater over midcalf culottes made of grey suede. Soon afterwards she branched out into menswear, creating unisex sweaters, cardigans, and vests. Evening looks continued to be based on day shapes, but fabricated of highly colored striped shiny rayon or mohair. Pullovers, jackets, and vests were frequently long, and Adri kept experimenting with new materials, such as eelskin, for her contrasting boldly colored belts, or handloomed Japanese fabrics with interesting textures. A touch of the opulent 1980s was evident in her use of tapestry jackets to be worn with velvet trousers, as well as damask and silk Jacquard. Clothes like these can be easily adapted for homesewers, and Adri contracted with Vogue Patterns during the mid-1980s for a relationship that continued into the 1990s. The same McCardell-inspired sporty yet fluid lines were evident; shirtwaist dresses with topstitching detail, softly gathered jackets, shaped hemlines with gracefully flounced skirts, cummerbund accents to shorten the appearance of tall, slim figures, gently gathered waists, and easy wrap dresses were some of the offerings available to seamstresses wishing to recreate Adri's classic multifunctional designs. Since changing her corporate name to Adri Studio Ltd. in 1994, Adri has continued to design small collections. Hard at work in her New York studio, she has focused on designer collections exclusively. With her Egyptian partner, Nadia Abdella, Adri continues to fashion the fluid, timeless pieces for which she has always been known. "The concept," she says, "remains the same." This design concept was always, she noted, a very flexible, contemporary one and has continued into the 21st century quite successfully. She creates one exclusive designer collection a season that is both wholesale and retail. The Adri collections are available through exclusive stores and show in private clubs, such as The Ruins in San Francisco. This approach, both simple and consistent, and the adaptable charm and enduring quality of an Adri garment, have created a niche for the designer and, "It's working," she says. Adri passed away December 17, 2006 of Parkinson's Disease at her home in NY. She was 71.